« Double trouble for the T in the park Music festival. 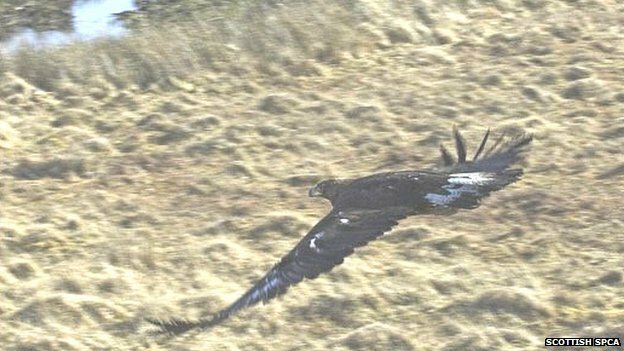 A golden eagle that was found injured on the Isle of Mull last August has been released back into the wild after almost eight months of care and rehabilitation by an animal charity. 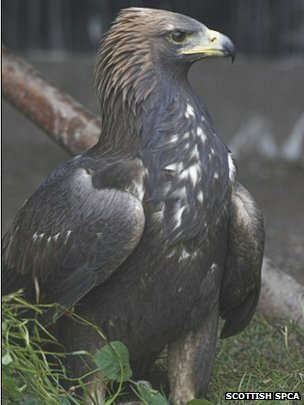 The male eagle, named Bud, was found with a damaged wing on Mull and rescued by the Scottish SPCA. The charity worked with Raptor World and the RSPB to help it overcome the injury and a subsequent leg break. Bud was freed on 13 March – the first time the Scottish SPCA has returned an injured golden eagle to the wild. Colin Seddon, manager at the charity’s National Wildlife Rescue Centre in Clackmannanshire, said the juvenile golden eagle had been found by a farmer on Mull. “Bud was found to have soft tissue damage to his wing which took a long time to heal and unfortunately once he had fully recovered he broke his right leg in a freak accident,” he said. “The break was repaired by a vet using an external fixator and as the healing process was very long Bud was kept with us over winter. Mr Seddon said they had to wait for a “reasonable weather window” to release Bud. “We didn’t want to release him in a period of heavy rain as he may not have been able to hunt,” he said. Mr Seddon added: “Bud is the first ever golden eagle we’ve been able to release back into the wild and everyone involved is extremely pleased with the outcome.